The vada-pav - a fried potato patty tucked in a bread roll - may have started out as the humble fare of Mumbai's working class, but it has lofty ambitions. Sarath Naru, Managing Partner at venture capital and private equity fund VenturEast, which invested Rs 21 crore in the Goli Vada Pav chain in August, says the company "could list on the stock exchange in five years, and be a leading player in the Indian fast food market ". Indian 'street food' has come a long way from the kerbside shack. Goli Vada Pav, which started in 2004 in Kalyan, near Mumbai, now has 125 outlets in not only Bangalore, Hyderabad, Mumbai and Pune, but also locations such as Satara and Kolhapur in Maharashtra; Hubli and Belgaum in Karnataka; and Coimbatore in Tamil Nadu. The focus, says co-founder and CEO Venkatesh Iyer, is on a delivery model that can be rapidly scaled up. He is aiming for 500 outlets in five years. Private equity investors have been paying close attention. "We watched Goli Vada Pav for two years," says VenturEast's Naru. "What appealed to us was that they had worked on the back end, had a committed team, created a market outside Mumbai, and were in the ethnic fast food business, which has huge growth potential." Naru is not the only one who smells an opportunity. G.V. Ravi Shankar, Managing Director, Sequoia Capital India, recently invested $5 million (Rs 22 crore) in Faaso's, a Mumbai-based chain set up in 2004, that serves wraps with a desi flavour, such as paneer tikka and paneer reshmi. Sequoia has been in the space earlier - its $20-million investment helped Cafe Coffee Day grow into a 1,200-outlet chain. What attracted Ravi Shankar to Faaso's, besides its dynamic team, was its focus on execution and scalability. "Faaso's is a young company with 16 outlets in two cities, and we are willing to work with them for five to seven years - whatever it takes," says Ravi Shankar. In five years, he says, it could have more than 300 outlets. Faaso's co-founder and CEO Jaydeep Barman, a former associate principal at McKinsey & Co in London, says the company plans to have 200 outlets in the National Capital Region, Bangalore, Hyderabad, Pune and Mumbai by April 2014. Set up in 2004 with seed capital of Rs 8 lakh, Faaso's is opening a new store practically every month, at a cost of Rs 10 lakh to Rs 20 lakh each. Barman says the pace of growth may increase to three outlets a month by April 2012, and by 2014, Faaso's will need a fresh round of funding for nationwide expansion. Milk producer Amul and Mukesh Ambani's Reliance Industries have set their sights on the fast food business. Asked about news reports that Reliance was in talks with Warren Buffett's Berkshire Hathaway to launch its Dairy Queen brand in India, a Reliance official said: "It is still early to comment, but yes, we are looking at quick service restaurants." The Gujarat Co-operative Milk Marketing Federation, which owns the Amul brand, has tested two outlets, called CafÃ© Amul, in Ahmedabad. In October, it opened a franchise each in Ahmedabad and Bangalore. Offerings include pav-bhaji, pizza, burgers and ice cream. "It is a natural fit with our dairy business," says R.S. Sodhi, Managing Director of the Federation. "We plan 10 more franchise outlets by March 2012." Amul's sales turnover in 2010/11 was Rs 10,762 crore. Quick service restaurant sales, estimated at $10 billion to $13 billion, are growing by 25 per cent a year. Unorganised players account for some 90 per cent of sales. No wonder big brands are making eyes at the sector. The fast food business is generally focused on a single product, and has a supply chain that can be scaled up. It is assetlight, with modest real estate requirements. For takeaway and delivery, real estate costs are about 10 to 12 per cent of sales - lower than the 15 to 20 per cent for outlets that offer seating and ambience. Bangalore-based Kaati Zone, which serves kathi rolls - a filling rolled in a roti or naan - has a central kitchen that supplies frozen ingredients to its 17 franchise outlets. "In 2010, we developed a store template with simplified operations and a focus on takeaway," says Kiran Nadkarni, founder and CEO, Kaati Zone. "We can set up an outlet in four weeks flat." Depending on the location, he says, a franchisee can recover costs within 20 months. Vinay Nagpal, Director, Des Amis Foods, who set up a franchise in Chennai in August 2010, says he hopes to recover his cost - around Rs 25 lakh - by August 2012. Nadkarni aims to have 800 to 1,000 outlets nationwide in five years, and says he sees no problem raising funds. So why has the chain, which started in 2004, not added a single new store in the past year and a half ? Nadkarni says that the focus has been more on building scalability than on adding outlets. "Now that we have attended to scalability issues, we are expanding," he says. For early entrants, there was no alternative to trial and error. "We had a central kitchen in Dombivli, east of Mumbai, from where patties were delivered in refrigerated vans," says Iyer of Goli Vada Pav. At his first shop, the production process was manual, he says. "The product had no shelf life. There were wastage and standardisation issues." 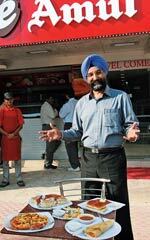 In 2006, he approached Vista Processed Foods India, the Rs 150-crore Indian arm of the Chicago-based OSI Group which makes burger patties for McDonald's India, to procure ready-tofry patties. Vada-pav production was reinvented, with X-rays and metal detectors. 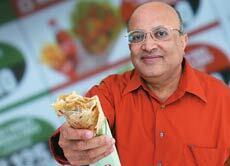 "Our product is standardised, with a sixmonth shelf life when kept frozen," says Iyer. Outsourcing may have saved crores for Goli Vada Pav, by eliminating the need for a centralised kitchen, but it makes sense for Faaso's, which runs its own outlets. Currently, Faaso's outlets are supplied marinated ingredients, but the company expects to have some 300 outlets in the next four to five years, so it is planning centralised supply and storage. CEO Barman says he expects new outlets to start making profits within 12 months. Talk about a fast buck.